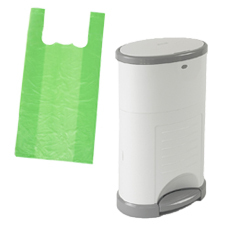 Nappy bags and bins are designed for easy disposal of incontinence products. Refill cassettes prevent germs and offer light to extra odour protection. Nappy bins are discreet and hygienic, locking aware odours and germs effectively. The bins feature different capacity levels depending on the level of incontinence. The bags are available in two styles zip close and tie fastening.